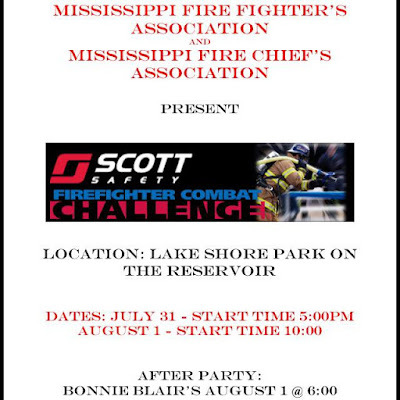 The Firefighter Combat Challenge is here again! 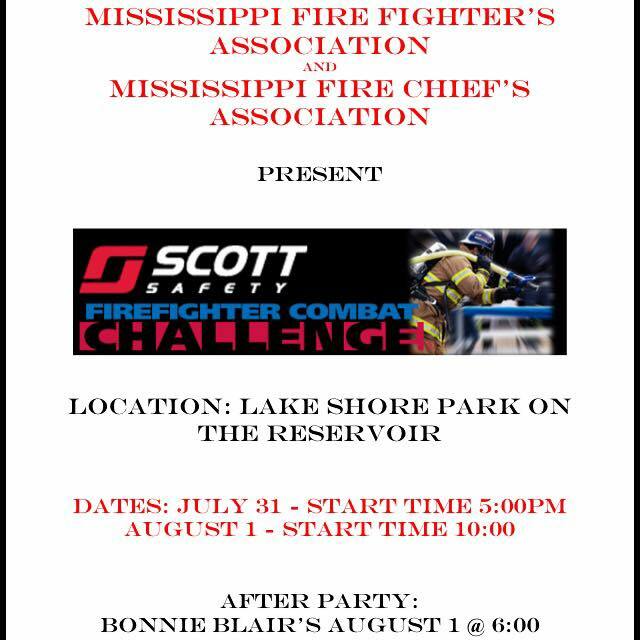 Come out to Lakeshore Park this Friday (5-7p) and Saturday (10- till) and see Firefighters in action competing against each other In a fun filled action packed competition! There is also a kids challenge for the little guys and gals to come enjoy! The boat ramp in Forest Point Subdivision has been leased to the Forest Point Homeowners Association, thus closing access to non-members. This is a trend that began with private boat ramps in newer subdivisions like Fox Bay, and continued with the closure of the Safe Harbor launch. The next step is to now close smaller ramps in subdivisions which have long been open to the public. Jim McDowell warned us of this long ago in June of 2011 with this blog post. The parks were once private, designated for the use of the residents of the subdivision where the park was located. The Pearl River Valley Water Supply District even issued bumper stickers to residents so the Reservoir Patrol could identify park users. 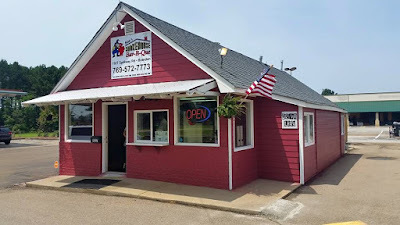 Tommy's Trading Post, home of one of the best burger's in Rankin County, has a website. Go figure. You can find out what the lunch special was on March 15, 2012. To keep up, you might have better luck on their Facebook page. Here is a link to a story Jim McDowell wrote in 2011. It concerned comments Flowood Mayor, Gary Rhoads, made at a Rankin County School Board meeting related to Northwest Rankin Attendance Zone. Flowood was, at that time, exploring the possibility of creating an independent school district from the schools in the Northwest Rankin Attendance Zone. 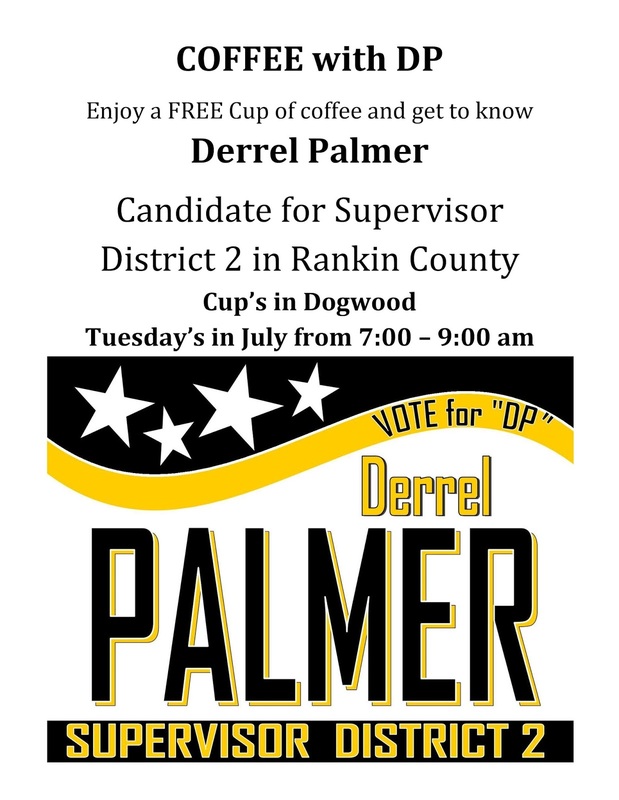 I've heard nothing more about this possibility, but it always struck me as a significant statement; one that would have a profound, negative effect on the remaining schools in the Rankin County School District if it ever occurred. It certainly concerned the citizen readers of the Rez News; check out the "comments" section. This story made me appreciate the asset Jim was to our community. The next Movies-N-Moonlight, this one sponsored by Community Bank, is Tuesday, July 28, 2015, at Winner's Circle Park. Paddington is the movie being shown. It's free for everyone and begins at dusk. Here is a good chance to meet many of the candidates running for office: One week from today, the Rankin County GOP Social Club will have a social at Cerami's Restaurant in Flowood. 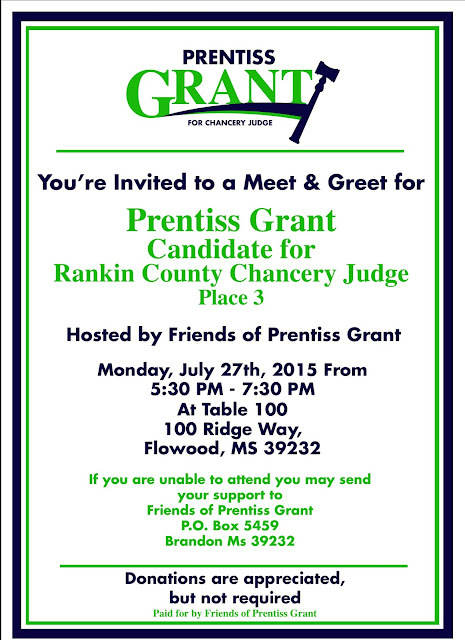 5:30 p.m. to 7:30 p.m. All are invited. The Jackson Daily News reported on September 11, 1938 that legendary bootlegger and Gold Coast operator Big Red Hydrick was arrested. He was suspected of burning down another club and also of being an accessory to highway robbery. There were a series of burnings of Gold Coast clubs at the time. The debate renewed recently over the presence of the confederate stars and bars, which is incorporated in the canton of the Mississippi State Flag. When asked, the Governor stated the 2001 state-wide referendum vote should control any present decision on the flag. While reviewing old election results in Rankin County, I happened upon the data from that vote and found it interesting. In 2001, 34,053 people in Rankin County voted on the flag referendum. Of that total, 25,311, or 74.62% of voters elected to maintain the state flag. Only 8,609 voted to change it to the commission's proposed design. Statewide, the percentage to keep the state flag was 64%. Only the South Pearson, Whitfield and Mullins precincts had a majority of voters seek to change the flag. If you are interested in the data, check out the precinct results here. Photo dump for folks who tag the Ross Barnett Reservoir. I've been remiss by failing to post this earlier. The Lego Movie is being shown tonight at Winner's Circle Park in Flowood. It's the Movies-N-Moonlight, put on by the Flowood Chamber of Commerce, thanks to the generosity of C Spire. The "gates open" at 6:30 p.m., but the movie starts at dusk. Bring chairs or a blanket, and plenty of liquids; we are in a heat advisory until 7 p.m. as issued by the National Weather Service. These events are fun for the whole family, and it's totally free. A woman sustained non-life threatening injuries yesterday evening on Lake Harbor Road in Goshen Springs, when she was shot in the head by her husband during a domestic dispute. Michael William Farmer was arrest, as was an accomplice, Michael Scott Minton, who allegedly assisted with the attempted destruction of the weapon. Here is the WLBT story, complete with video. Here is the WLOX story with more details, including, the victim was holding a baby in her arms when she was shot. Here is an interesting video of Shaye Baker fishing on the Ross Barnett Reservoir. The Gold Coast wars never ended back in the 1930s. They just ebbed and flowed as the tides do on the shores of the Pearl River. The Jackson Daily News reported in 1937 that the Rankin County grand jury acted "to doom Gold Coast" as it returned a series of indictments. The newspaper articles are posted below although they were copied from microfilm. Needless to say the Gold Coast did not disappear but flourished through a storm of raids, investigations, and arrests over the next thirty years. The Pearl River Valley Water Supply District posted a ton of pictures from the Independence Day Celebration onto their Facebook Page. The winners of the car show have also been announced. According to the PRVWSD, Best of Show was Doug White and his 1966 Dodge Coronet Convertible. The Top 5 cars were Gary Smith's 1955 Ford Victoria, Barry and Christian Berry's 1962 Chevrolet Impala, Wilson Phillips' 1940 Ford, Jack Curtis' 2011 Dodge Challenger, and Gene and Susie Roberson's 1930 Hudson. The PRVWSD takes the position that piers, boathouses, or other structures, extending into the Reservoir from residential property, are without authority unless that area in the water is included in a lease. The PRVWSD argues the waterfront leases entered into with lessees stop at the water's edge; therefore, private piers or boathouses -- some of which extend 25 feet into the Reservoir -- are not located on the homeowner's lease. If that homeowner wants a pier, he or she will have to lease additional acreage in the water to do so. The alternative, I imagine, will be for the PRVWSD to tear down the structure. 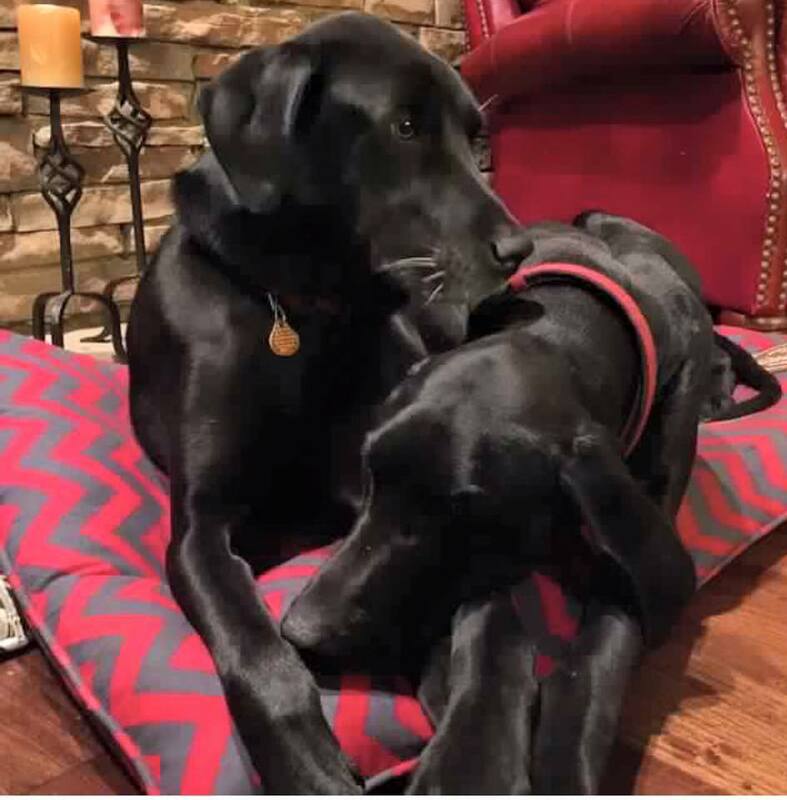 Rez Friends, please keep a look out for these two dogs. They escaped from their home in Lineage Lake last week and are still having trouble finding their way home. They were last sighted near Luckney Road and Riverbend. Their names are Jinx and Silas. They are large, black and very friendly. If you have any information of their whereabouts, please either call their concerned owner (Jake) using the number below, or comment on this post. They escaped together, but may have split up. Thanks to all. 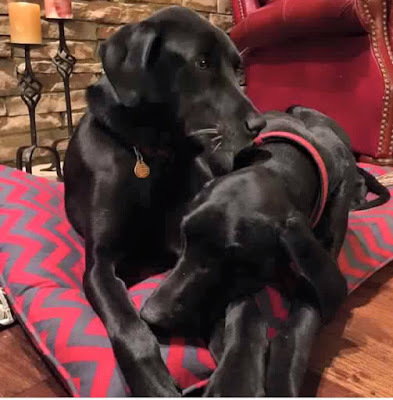 HELP US FIND OUR DOGS!! 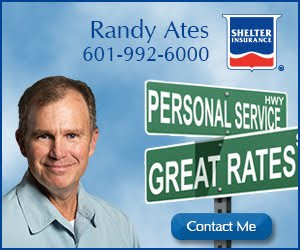 I know we've shared this a lot but please call us at 601-951-1131 if you have ANY news on these guys! Happy 4th and thank you!!! Governor follows up with second raid on Gold Coast. The Gold Coast bosses might have been crooked but they weren't stupid. Governor White sent the troops in on June 23, 1939 to shut down the gambling and drinking earned the Gold Coast its name. The Governor knew the fine establishments of the Gold Coast had been raided before and would reopen and act as if nothing had ever happened. Governor White thus conducted a second raid on the Gold Coast on Saturday night on June 25 only to find very little liquor to seize. Here are copies of the original articles. The Gold Coast of Rankin County has a storied history. The Gold Coast was the section of Rankin County where Casey Lane and Fanin Road traversed near the Pearl River. Commonly referred to as "East Jackson", it was a hotspot of booze, gambling, nice restaurants, and good music for forty years. There was just one problem- Mississippi was a dry state (although beer was legal) and thus the bootleggers ran the Gold Coast. There were tides of trouble and tides of peace for the Gold Coast as do-gooders would get worked up about the Rankin County and pressure law enforcement and other government officials to shut down the Gold Coast. However, there was simply too much money flowing through the Gold Coast to keep it shut down forever. Governor White sent the militia in to raid the Gold Coast in 1939. I spent some time yesterday at the Department of Archives and History reading and copying old issues of the Jackson Daily News and the Clarion-Ledger. Here is a story from June 23, 1939 about the Governor's use of troops to bust up the playground of the bootleggers. More copies of vintage articles will be posted over the next several days. This has been a great way to see who reads the Rez News. Below, I've posted Judge John Shirley's responses. 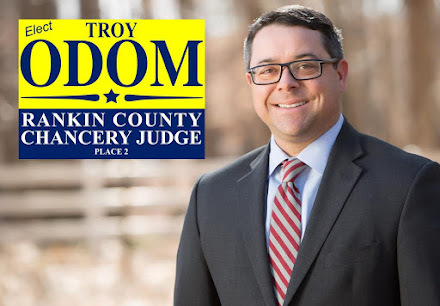 Judge Shirley is a candidate for re-election to Justice Court Judge. Boo's Smokehouse Bar-B-Que is now open at 1927 Spillway Road. It's open from 11 a.m. to 9 p.m. Monday through Saturday. This appears to be a mere extension of the main Smokehouse Bar-B-Que at the intersection of Lakeland Drive and Hwy 471, and I assume the ribs will be as delectable. I praised the Rankin Record in an earlier post, and recommended my readers review the question-and-answer article with the Rankin Supervisor candidates. I couldn't find an online version of the article, so therefore could not post same. Daniel Cross, candidate for Supervisor District 2, kindly submitted to me his answers. I post those below, and I will gladly post any others who submit same.